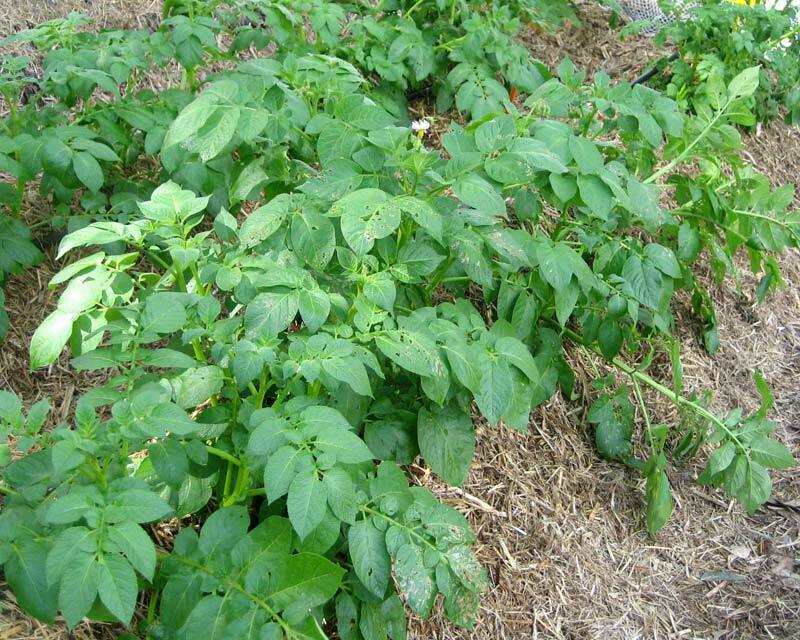 Solanum tuberosum, or the common Potato was introduced into Europe in 1565 and fairly quickly became the staple food of large parts of the world. 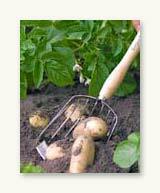 The potato is a perennial plant that is easy to grow and wonderful to eat, freshly dug from the garden. It produces dark green, hairy foliage on soft but erect stalks, and white (or sometimes mauve) star-shaped flowers, that appear in clusters. 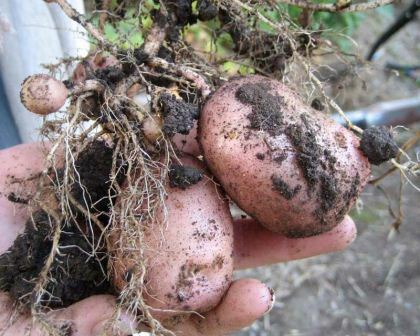 As the foliage starts to die back, generally between 8-14 weeks from planting, the underground tubers can be harvested by digging carefully around the base of the plant. 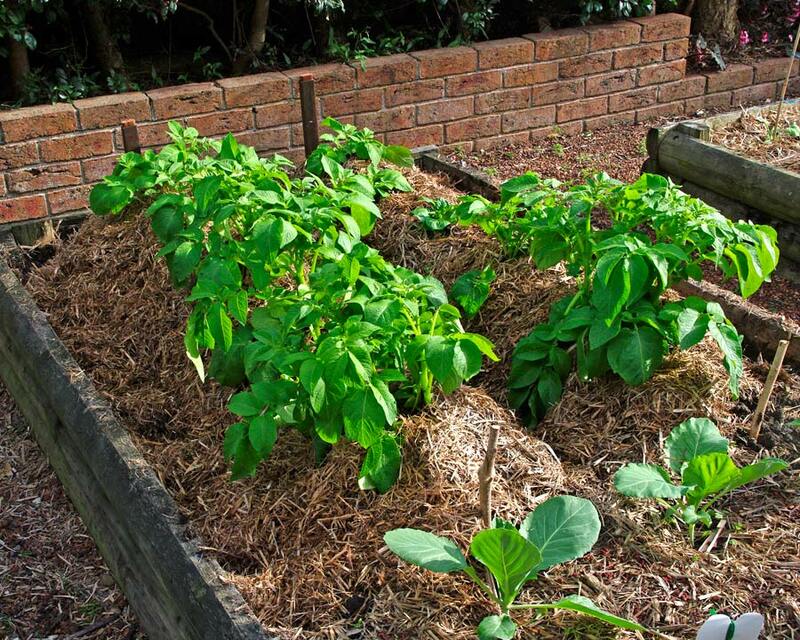 Ensure that you remove all potatoes, regardless of how small they may be as they will grow to new plants in the next season - which may or may not be a blessing, depending on what you have planted in that patch next. 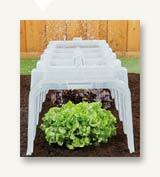 Soil: Open and well drained, friable soils - best planted in raised rows and mulched with straw in cold climates. N.B. 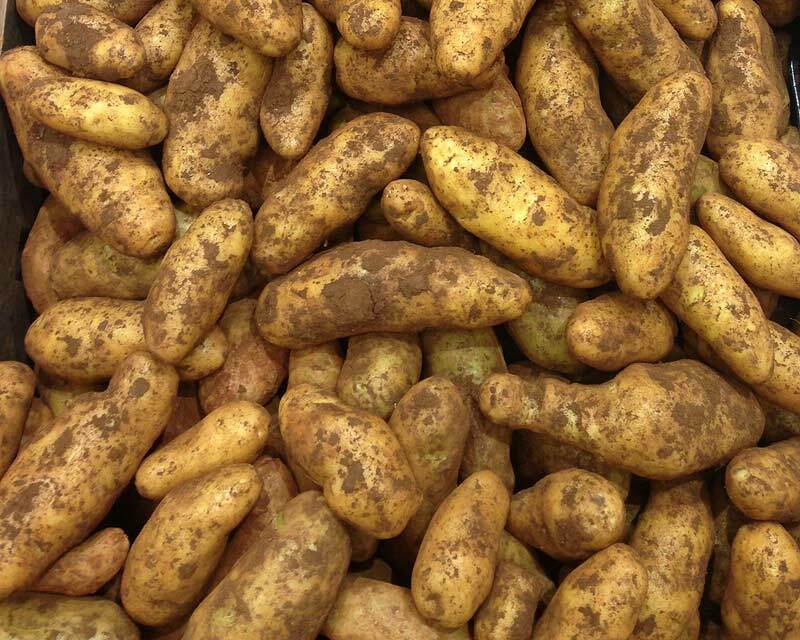 its always best to purchase certified seed potatoes which are selected for optimum size and be guaranteed free of disease. You can just take some from your larder when they start to sprout, but you will cannot be certain that they will not transfer some disease from their grown location to your garden. If you have a large see potato with multiple eyes (or shoots) then you can slice it into multiple segments with one eye or shoot per segment and plant it. Maintenance: Keep well watered, especially during high growth phases - but don't let them become waterlogged, or the potato tubers will rot. Wait until the flowers have died back before lifting - N.B. 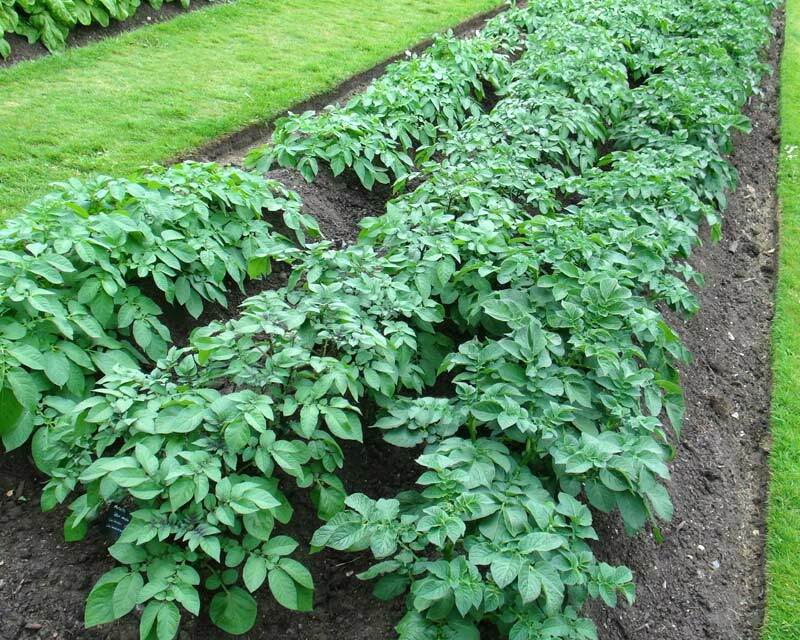 green potatoes have a poisonous alkaloid substance in them called solanin - this occurs from tubers that are not completely covered in soil, the light causing them to turn green. 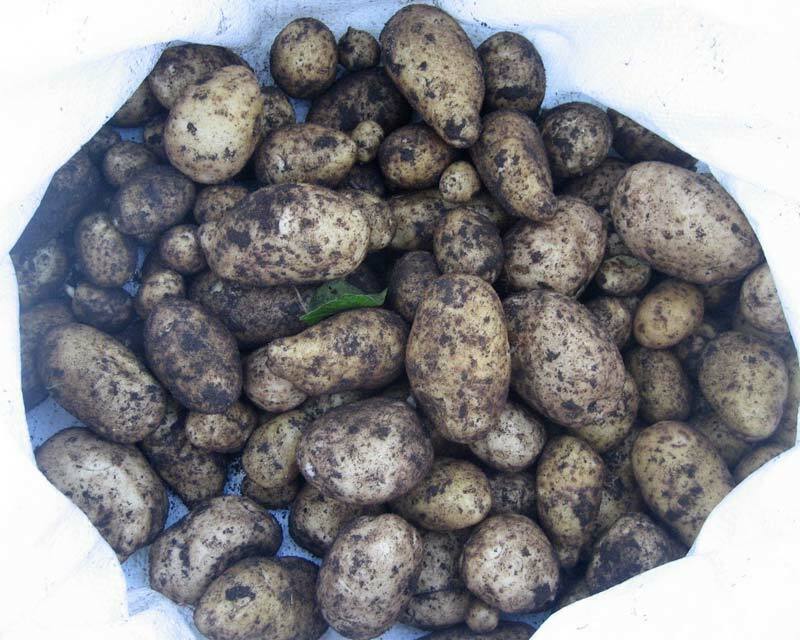 Diseases: Potatoes are unfortunately prone to a wide range of diseases including Bacterial like scab or wilt, Fungal, of which Blight, Fusarium and Rust are the most prevalent, as well as various viruses. 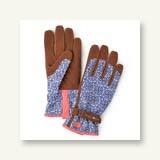 However most gardeners manage to produce healthy crops. If you are unlucky to have an infestation then ensure you remove all spent foliage from your garden (council waste bins are best), do NOT put any in your compost. 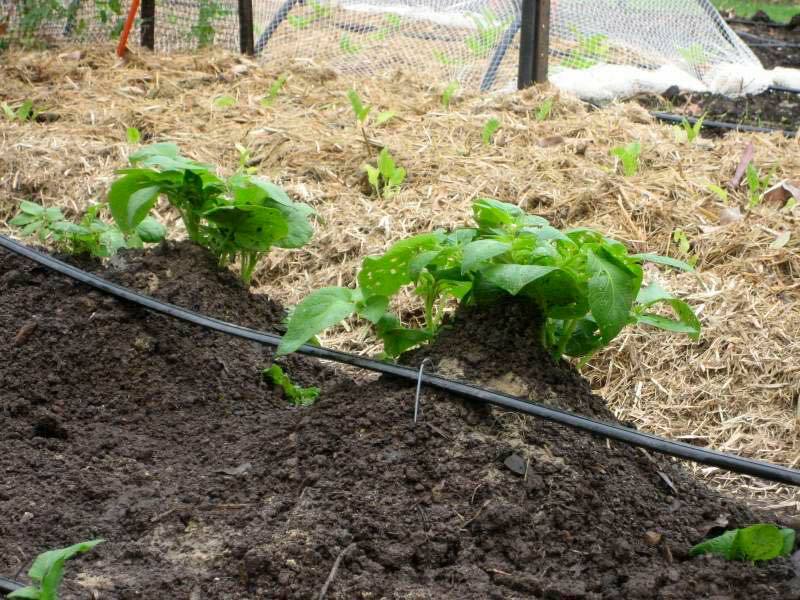 Crop rotation is the best way to eradicate diseases from your veggie patch, along with removal of the top layer of soil from a previously diseased crop area. 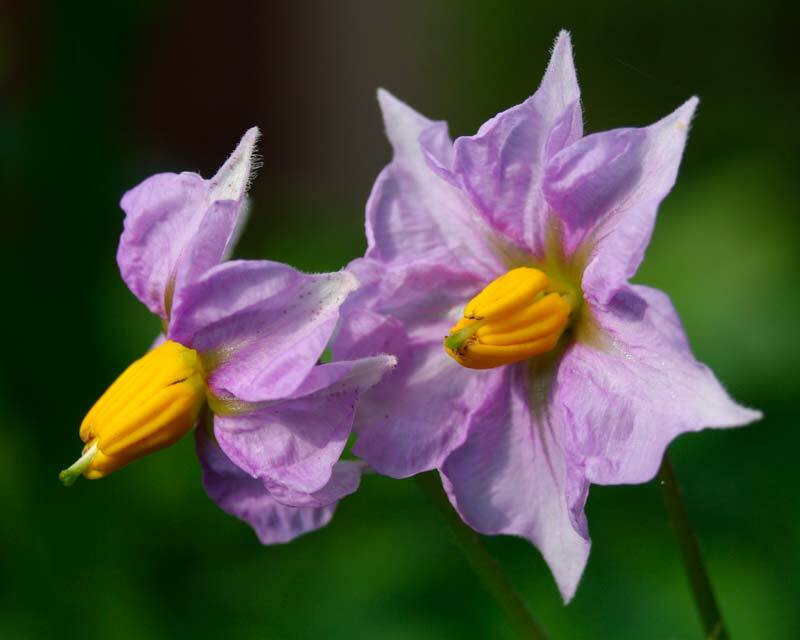 Other Species: 1,400 species in the Solanum genus including many ornamental shrubs, trees, perennials and climbers - also includes the aubergine, or egg plant. Comments: Many species are dangerously poisonous - but thankfully the very small amount of solanin present in the potato is destroyed in cooking. 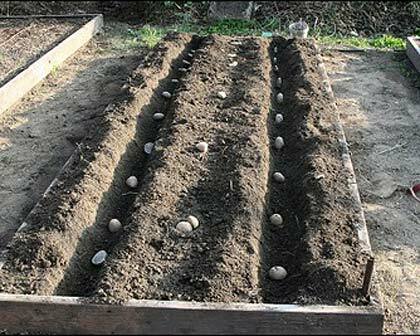 Potatoes as they should be grown being earthed up for moisture retention.